Formulated for small breed dogs under 20 lbs. Antioxidant rich for healthy immune system. Optimal nutrition in small bite size kibble. 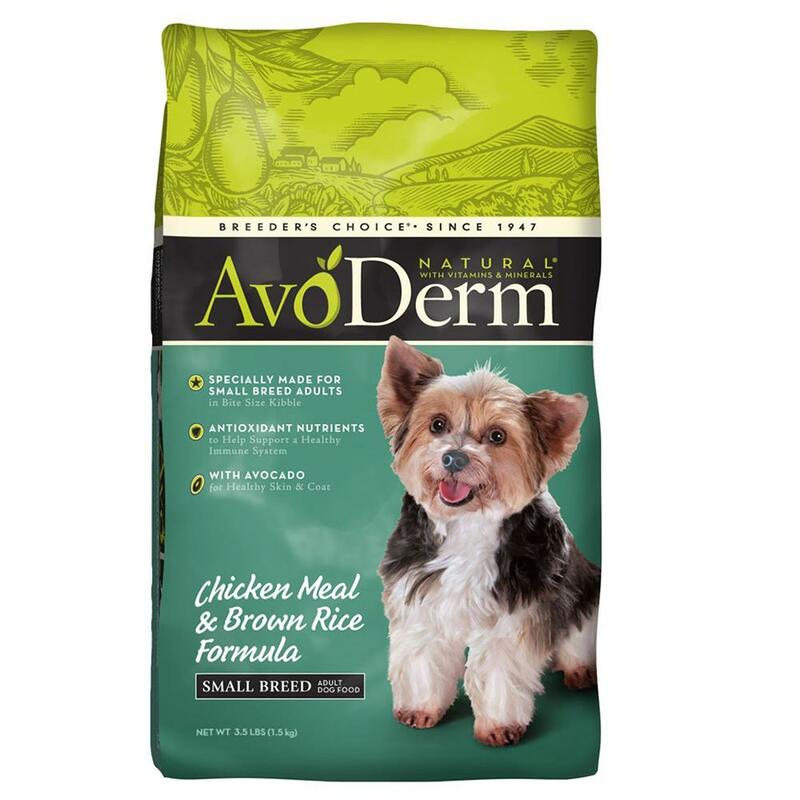 AvoDerm Natural Small Breed Adult provides quality protein sources that are ideal for adult dogs with sensitivities to other protein sources. We use only quality ingredients in all our formulas to provide healthy, balanced levels of protein, fat, and nutrients for adult dogs. High quality ingredients eliminate the need for unnecessary preservatives and additives- things your dog's diet definitely doesn't need. Our foods are naturally preserved with vitamins to ensure freshness and palatability. Feed AvoDerm Natural regularly to sustain the highest level of nutrition for your small breed dog from the inside out. Chicken Meal, Brown Rice, Ground White Rice, Oatmeal, Chicken Fat (Preserved with Mixed Tocopherols), Rice Bran, Tomato Meal, Dried Beet Pulp, Natural Flavor, Dried Whole Egg, Flax Seed, Alfalfa Meal, Dried Chicory Root, Avocado Meal, Avocado Oil, Salt, Potassium Chloride, Vitamins (Choline Chloride, a-Tocopherol Acetate (Source of Vitamin E), Niacin, Calcium Pantothenate, Vitamin A Supplement, Ascorbic Acid (Source of Vitamin C), Pyridoxine Hydrochloride (Source of Vitamin of B6), Thiamine Mononitrate (Source of Vitamin B1), Riboflavin Supplement (Source of Vitamin B3), Vitamin B12 Supplement, Vitamin D-3 Supplement, Biotin, Folic Acid), Minerals (Zinc Sulfate, Zinc Amino Acid Chelate, Ferrous Sulfate, Iron Amino Acid Chelate, Manganese Sulfate, Manganese Amino Acid Chelate, Copper Sulfate, Copper Amino Acid Chelate, Sodium Selenite, Calcium Iodate), Kelp Meal, Yucca Schidigera Extract, Lecithin, Rosemary Extract, Sage Extract, Bromelain, Papain, Dried Bacillus Subtilis Fermentation Product, Dried Aspergillus Oryzae Fermentation Product.